A Mosaic Made of Wine Corks! Home / Blog / A Mosaic Made of Wine Corks! If you heard about Samir Strati, you can expect nothing less than such level of unusual creativity. After creating many outstanding works, it became an annual tradition for Samir to set a Guinness World Record. Known to be a mosaic artist, Strati used nails, toothpicks, eggshells, compact discs, coffee beans among other materials to create the world’s most unique mosaics. 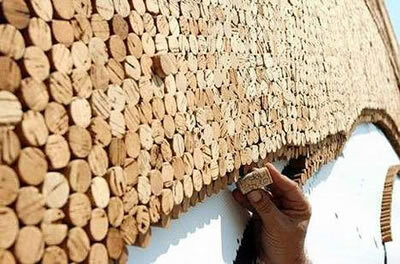 One of his remarkable works is this 3D painting made of 300,000 wine-bottle corks. The photos show the Albanian artist work on what will turn out to be a 96 square meter masterpiece depicting people playing guitar. Every world record attempted by Saimir was a live performance, just like this masterpiece. After 27 days of hard work in the hot Albanian sun under the eyes of the Sheraton Tirana Hotel and Towers’ visitors, the largest cork mosaic was built using 229,764 corks!